Whether you’re cleaning up your house for sale, helping a loved one to move, or just trying to get rid of some clutter – you’re bound to encounter household rubbish that is simply too difficult to move on your own. So, what do you do when you find an appliance or piece of furniture that is too bulky to handle? Professional rubbish removal services can be a great help! Taking any hazardous, large, recyclable, or miscellaneous unwanted items off your hands, a removalist ensures your rubbish is properly and safely disposed of, so you can stay stress-free. Over time, most of us accumulate some type of household waste; old appliances, unused pieces of furniture, broken toys or tools – they all seem to find their way into the back of our garages and cupboards. There inevitably comes a time when we’re faced with having to clear away our backlog of rubbish. Having professional assistance in this can save you considerable time and headaches as you’re cleaning. Loading, transporting, and correctly disposing of your household rubbish can be a very demanding process, especially if you have multiple items to move and no experience dealing with waste of this size. Arranging for rubbish removalists will help you avoid accidental injury, as loading up skips with large items requires a lot of hard physical work that doesn’t bode well when you’re inexperienced. Rather than endure these difficulties in the unforgiving Brisbane temperatures, leave it to the professionals. A rubbish removal service will be able to remove all items in one visit, regardless of their hazard, risk, or weight. Best of all, they will tide up after themselves, to save you even more time cleaning up the mess left behind. Extra large items can even be demolished first before they are trucked away, so you don’t have to worry about your items being too big to move. 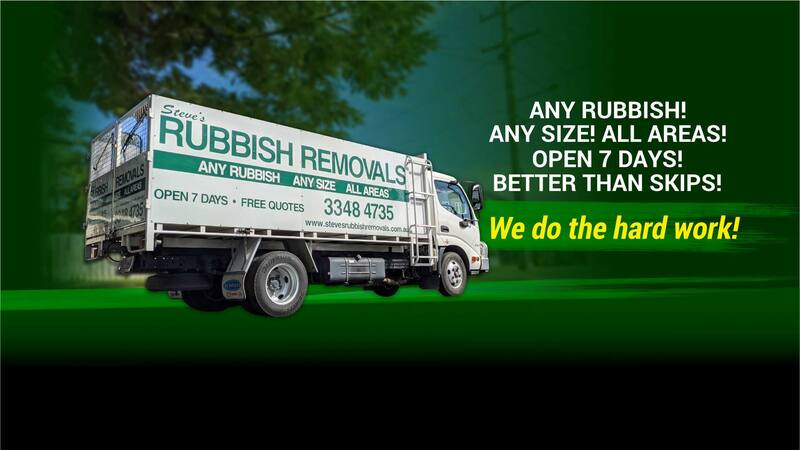 Steve’s Rubbish Removals services the whole of Greater Brisbane and surrounding suburbs, 7 days a week. To get a quote and arrange a convenient time for you, all you have to do is give us a call on 07 3348 4735.